Since 2003, Inclusiv has partnered with national organizations serving people with disabilities, including the National Disability Institute (NDI) and the World Institute on Disabilities (WID), in order to bring financial services, access to credit, and financial education tothe disabled community, a market disproportionately represented in America’s low-income communities. Inclusiv is engaged in several activities to increase awareness and expand the outreach and impact of community development credit unions (CDCUs) working with people with disabilities. Building Economic Strength Together (BEST) Internship Program: Inclusiv and partner organization, the National Disability Institute, developed a pilot internship program that placed individuals from the disability community with six-week internships at credit unions. The two-year program was funded by the Kessler Foundation and resulted in 52 people with disabilities interning at New Jersey credit unions. Many of the interns were hired on as employees for the credit unions. The success of the programs resulted in the additional funding for a program in New York which begins in the fall of 2013. Information Dissemination: Inclusiv contributed an article to the publication Building a Better Economic Future that showed how CDCUs provide financial education and services to people living with disabilities and the poor who are traditionally overlooked by mainstream financial institutions. Building Bridges, Breaking Barriers: Inclusiv’s Education and Training Department developed a disability module, Building Bridges, Breaking Barriers to enhance its educational curricula offered through the CDCU Institute™ and the Each One, Teach Many financial literacy instructor training program. 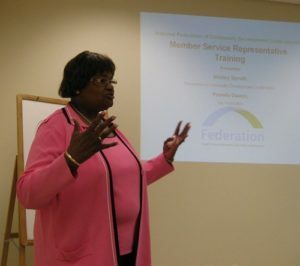 To date, over 1,000 credit union personnel have been trained and have provided financial education to over 23,500 people nationwide, 3,500 of which were individuals living with disabilities. Disability Etiquette Training: This training was conducted for disability service organizations of the greater Denver Metro Area. Trainer, Tom D. Muniz, a wheelchair user and Disability Program Navigator for the Denver Workforce Center, concentrated on acceptable and preferred language, physical assistance and common misconceptions of the disabled community. Deaf Tax Volunteer Income Tax Assistance: The Denver Coalition, a sub-grantee of the Real Economic Impact Tour of the National Disability Institute was selected as one of five pilot sites for the Deaf Tax Volunteer Income Tax Assistance program to provide free income tax service to the sight impaired via video phone, live certified tax preparers. REACH Awards: The Community Development and Financial Resources CDFR, Inc., of Wichita was a pilot site for this grant honored four individuals living with disabilities with the Annual REACH awards. The REACH Award honors the exceptional accomplishments of individuals living with disabilities. Honorees are those who have faced amazing adversity and, through determination and perseverance, managed to overcome the challenges to prevail.